The most successful football team in the competitive Saudi Professional League, Al Hilal FC has a strong history and a better present with a brighter future in the coming years with the talent they have at hand. Grab yourself either a team jersey or team shorts, or get them both and show off your team pride and ride with “The Blue Waves” to another successful victory as you cheer from the stands or from the comfort of your home. 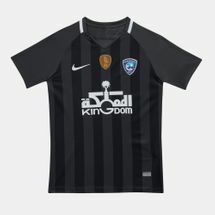 The Nike Al Hilal collection we house at Sun & Sand Sports features some of the best materials and technologies used to create it along with a large dose of rich history. Al Hilal FC is one of the most successful football clubs in the Middle East and they have all the accolades to prove their bragging rights. Launched in 1957 at the Olympic Club, it was later changed to Al Hilal FC after a year by King Saud Bin Abdul-Aziz. After winning the King’s Cup in 1961, the club went on to record a magnanimous 50 official competitions win. Upon the launch of the Saudi Premier League for its inaugural season of 1976-77, Al Hilal FC was the first ever club to win the league and it went on to do so 12 more times, while coming second as well for 12 years in a span of 32 years. If that isn’t impressive then we don’t know what is. When the Asian Cup Championship was first played in the year of 1991, they even went on to win it and since then Al Hilal FC has been the only Asian team to have achieved six Asian titles. With such a strong background and reputable history of this monumental club, why wouldn’t you want to be a part of a team of such calibre? Join the hype and get yourself Al Hilal FC jerseys and shorts delivered to your doorstep in Kuwait City or anywhere else in Kuwait.